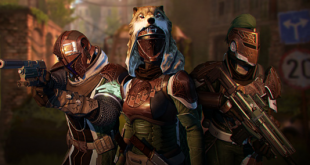 Home » NEWS » Destiny going green for April update: Bungie recycles old content, plus pay to win! Destiny going green for April update: Bungie recycles old content, plus pay to win! 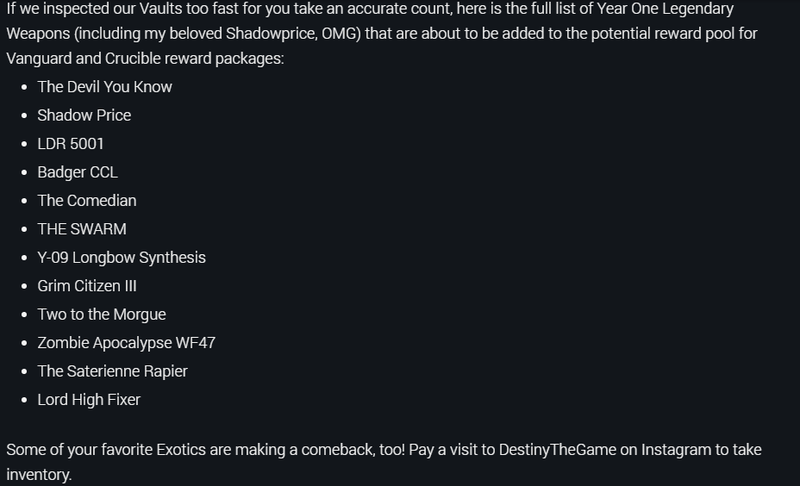 As part of Bungie’s commitment to updating Destiny periodically (i.e. whenever they feel like it), the upcoming April update promises to bring a large amount of old content forward to Year Two standards (i.e. bigger numbers). Plus it’s free stuff, since it’s technically just an update. 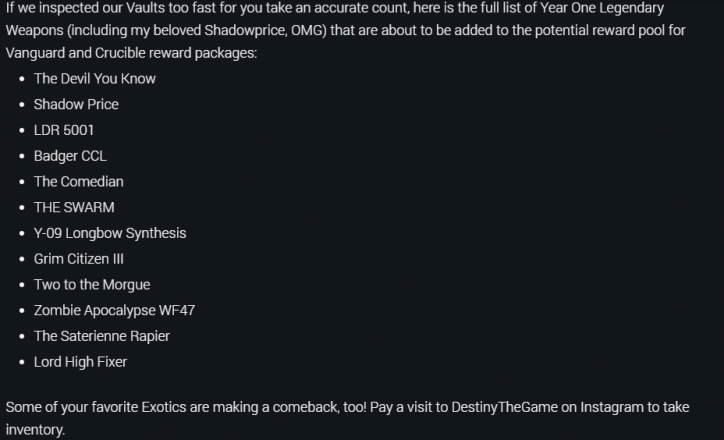 However, it should be kept in mind that as with all of Destiny’s updates, there is another item by which you can spend real money on (more on that later). You seem familiar, have I met you before? 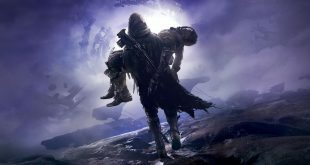 A large criticism of Destiny’s Taken King expansion was that it completely invalidated almost every piece of DLC and original content that came before it. With the April update however, Bungie is looking to at least partially rectify that mistake by updating a fair amount of armor and weapons (of both the normal and Exotic quality) so that they are viable in Year Two. Look at all these new old guns! The weapons themselves can only be obtained by increasing your rank with the Vanguard and the Crucible, and even then it is not a guarantee since (like everything else in the game) you only get a chance of maybe getting a weapon you want in the associated reward package. Fortunately, reputation rewards for Strikes, the Crucible, and the updated Prison of Elders have been “greatly” increased. So new, that it only looks a year old, but with LED lights! One of the few legitimately new items coming in the update is Chroma, which is basically a new material that lets you add LED lights to your armor and weapons. However, the effects range from “barely noticeable” to “in your face”, so you can look as dim or bright as you want. There is also a new Taken themed sword, at least a couple of new sets of armor for each class, and a handful of new weapons that bear the mark of the Queen of the Reef. What may be the best part of the update however is that the infusion system is being tweaked so that your gear will no longer receive partial stat infusions. In other words, you won’t have to carry around and destroy 10 other guns just to get one gun up to a certain level, and this applies for Exotics as well. It’s not pay to win if it’s cosmetic! No Destiny update would be complete without a new way to spend actual money however, and the April update is no different. Sterling Treasure boxes will contain things like armor and cosmetic items, as well as “boosts”. While you can obtain these boxes through normal gameplay, you can only obtain three per week. Alternatively, you can buy these Sterling Treasure boxes with actual money, which may present a slight problem. While the armor that comes from the boxes start off with a Light level of 3, they will have the normal set of stat bonuses and perks that every other set of armor has. This means that theoretically, you can keep buying Sterling Treasure boxes until you have the perfect roll on your armor, and then simply infuse said armor to the new level cap. The April update will also provide a sneak peak of what to expect in Destiny 2: Destiny Harder. Among other things, you can redo everything that you did in Destiny, but with slightly more cosmetic items, larger numbers for everything, and even more ways to spend actual money on microtransactions. 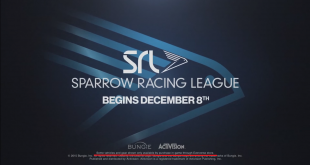 However, due to the popularity of some of the original content, there will be no actual new content in Destiny 2, or Destiny 3: The Hungering Bank Account.